Hello, friends! Today, I'm sharing ideas for celebrating Independence Day here in the USA! Quite frankly, you can adapt the color palette for any holiday or occasion! With just a few paper crafting supplies you can create embellishments to jazz up any celebration! For those visiting for the first time today from Mary Fish's Stampin Pretty blog where I am her Sunday guest stamper, welcome! And for those who've been to Peonies and Paper Chains before, welcome back! The Lucky Stars Textured Impressions Folder and either the Star Framelits or the new Medium Star Punch to make a little pennant to adorn a serving bowl. So quick and easy! I used Stampin' Dimensionals to apply the star to the pennant as I love the added depth. Using the brand new Triple Banner Punch, my Lucky Stars embossing folder, and toothpicks allowed me to transform basic Real Red and Night of Navy cardstock into decorative flags! Placing the bite size brownies in a ceramic egg tray provides an unexpected serving twist AND provides an opportunity to use this tray beyond the Easter holiday. Using a Circle punch and sewing machine, I was able to make a paper garland and to later snip off a small portion to decorate this "Pint and a Half" Mason Jar. It is just the right size for holding a several boxes of sparklers! Having grown up in New Hampshire (where fireworks and sparklers are perfectly legal), sparklers have long been a part of my 4th of July traditions. Living in the Granite State now, I can share this tradition with my girls. I'm a big fan of garlands and you can easily make this either with or without a sewing machine. And, if you you are going to make one garland, I say make a few and layer them together! If you look closely, you'll notice that I used the Decorative Dots embossing folder on the Real Red pennants and the Lucky Stars folder on the Night of Navy ones. The zig zag design is from the Work of Art stamp set -- definitely a fun twist on the traditional "stars + stripes" look! This Take Out Box would be perfect for sending home treats with guests attending a holiday gathering that you are holding OR for bringing a hostess gift if you will spending the day at someone else's home. You could also fill a Take Out Box with all the supplies for s'mores (less the sticks for roasting) and hand out to everyone around a campfire! The stamps are from Work of Art, the red polka dots were created with a Sponge Dauber, and the double ended banners had their ends snipped with the Triple Banner Punch. I also used my Word Window punch to help weave my card stock "ribbon" around the box. A big thank you to Mary for having me as her Stampin' Pretty Sunday guest stamper! Hope that you are leaving with some ideas for ways to create a festive mood at your home over the holidays! Which idea are most likely to try? You may just be starting the blog hop or may have come from Lisa Pretto at InkBig Academy Stamps, number 3 on the Pals Hop. If you get off track at any time, the full lineup below will help you move along from blog to blog so you see all the projects. Mint Macaron cardstock was perfect for the treat bag base and the two-tone effect was created by applying Bermuda Bay ink with my brayer. This is one of my "go to" techniques! I adore the tone-on-tone look of the Blushing Bride ink and cardstock...it provides a soft backdrop for the "way to go" sentiment. And, I think the gold sequin trim provides just the right amount of bling! Of course, after I finished and photographed the project, I realized that this seamed ribbon is retired...as in 2 years ago retired! Clearly I missed cleaning it out of my stash awhile ago! The perfect substitute is the 1/4" Cotton Ribbon in Blushing Bride and that is not one that I have on hand...sigh. Isn't it adorable? I can see getting a whole lot of mileage from this set! Time to hop along! The next stop is Lisa Ann Bernard at Queen B Creations, number 5 on the Pals Blog Hop! Thanks for visiting! Kerry Willard Bray at Peonies and Paper Chains - You are here! Hello friends! I'm delighted to share these thank you cards that I whipped up as my latest Pals Paper Arts design team project. And when I say whipped up, I mean that I made 20 of these note cards in under 30 minutes...not bad! School ends next week and I needed some more thank you cards for teacher gifts. The only thing you don't see are a set of Whisper White Note Cards & Envelopes and some Grid Paper to protect my work surface when using my brayer to create the So Saffron backdrop. Be sure to take a look at all the design team projects! Then, pull out these colors, give them a whirl, and share your creation with us at Pals Paper Arts! And before I sign off, I must say that I do love color challenges! They are my fave...how about you? And so much more! Truly, so much to love! View and shop by category in my online store. When I created this sketch I distinctly recall debating between a vertical and horizontal orientation. And, while I used the horizontal orientation of the sketch, I'll be so curious to see if others (maybe even you) choose to flip it. With this card, I used precisely 1 ink color (Blackberry Bliss), 2 card stock colors (Naturals White and Wisteria Wonder), plus a card base in Crumb Cake. However, as you look closely, you might think that more supplies were used. The three shades for the feather come from "stamping off" by Blackberry Bliss ink. The horizontal strip with the sentiment has some ink applied using my brayer. The card front has several tones on it and to achieve the look I first applied some ink with my brayer and then I embossed the card stock. Lots of interest and minimal supplies...makes for easy clean up and I like that! I know just who I will be sending this card to and I am sure that they will love the addition of the green star! Certainly they will appreciate it MUCH more than I did when it was added one night earlier this week! Be sure to visit Pals Paper Arts for all of the design team inspiration! After that, grab your supplies, get crafting, and share your project with us! Welcome to the Stamp Review Crew: Four Feathers Edition blog hop! We are excited to be sharing ideas featuring the Four Feathers stamp set. We've got a great line-up for the hop and you may have just come over from Mike Funke at Stampin' Style or perhaps you are starting here...whichever is the case, I hope you will hop on through all the participant blogs for oodles of ideas! As you can see the thank you cards that I have made are very quick and easy to make -- in my book that is essential when making a whole bunch of cards at once! Stamped on the feathers from the Four Feathers stamp set and whether alone or in repetition, they are pretty. Added the "thank you" sentiment comes from the Lots of Thanks stamp set. In about 20 minutes I created 5 each of the 4 designs shown above...that's just a minute each! In addition to the thank you notes, I made a coordinating thank you card for one of the teachers. It is a more intricate in design -- fitting for a teacher who give so much to ensure students have a wonderful year! Apparently I did not actually snap an image of the dog walking in front of the cards. Trust me though he did cruise on by my photo staging zone! Let's face it though, I really can's complain to have such wonderful distractions! Head over to see what Bronwyn Eastley at AddINKtive Designs has put together for you! You may just be starting the blog hop or may have come from Jennifer Michalski at Stamping Serenity, number 17 on the Pals Hop. If you get off track at any time, the full lineup below will help you move along from blog to blog so you see all the projects. and a whole lot more. There were so many choices! I just love the little collection of stars from the High Five stamp set! I provides a sweet little touch. The embossing folder is available while supplies last and the stamp set can be ordered until June 3 -- be sure not to miss out on these and other retiring products that you see in today's blog hop! The next stop is Amy Hoptay at Inking of You, number 19 on the Pals Blog Hop! Thanks for visiting; I hope to see you on next month’s Pals Hop! 5. Lisa Pretto at InkBig Academy Stamps! 13. Karen Hallam at Karen's Stampin' Habit! 18. 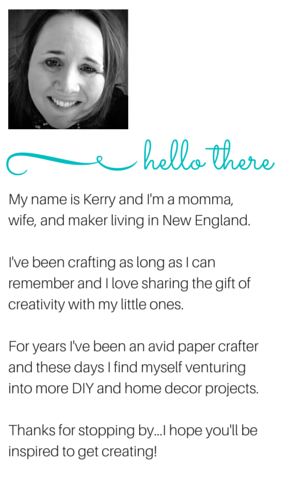 Kerry Willard Bray at Peonies and Paper Chains -- YOU ARE HERE! Birthday Wishes for PPA 250! This fabulous palette pairs the retiring In Colors of Coastal Cabana and Baked Brown Sugar with Hello Honey, an In Color that is sticking with us until 2016. I'm sad to see Coastal Cabana and Baked Brown Sugar go...I've loved these colors and was so glad to pull them out for this challenge! We have a few birthdays coming up and this polka-dotted mini muslin bag will be just right for holding a little gift and/or gift card! Use a Mini Brad or a Candy Dots Base to hold together the ribbon and to directly attach it to the Mini Muslin Bag. Mini Glue Dots can then be used to attach the stamped "embellishment". For added stability, you could put the brad through the bottom piece of card stock...I did not do this, but I think it would work well! Hope you'll grab your Coastal Cabana, Hello Honey, and Baked Brown Sugar and play along with us! Check out all of the design team inspiration over on the Pals Paper Arts blog and join us in using this combo! Purchase Stampin' Up! new catty sneak peeks now! The 2015-2016 Stampin' Up! catalog goes live to customers on June2 and I can tell you it is packed with a whole slew of new and fabulous products...stamps, tools, accessories and more. So much on my wish list already! One of the big perks of being a demonstrator (whether as a hobbyist or business builder) is to get to see and order new products before they go live! I'm guessing that some of you reading this would LOVE to see and purchase some of the new products now, and, by now, I mean today! The best thing is that you can! View sneak peek products here...and then come right back for details on how to order now! And, if you want a look at the new host sets, take a peek at those too! Okay, so, what did you think? Go to here and select the "join now" button near the top. Complete an Independent Demonstrator Agreement and then select up to $125 in products --- feel free to mix and match the sneak peek items with products from the current annual or occasions catalog, or any other items you can currently order in my online store! Note: The new 2015-2016 host sets are available at the full retail value during the sneak peek pre-order time. and, finally, my favorite -- the opportunity to become a part of a dynamic, supportive, and creative virtual community of paper crafting enthusiasts! When you purchase your kit through me you also become a part of Mary Fish's Stampin' Pretty Pals community. I've made so many connections with fellow crafters across the country from this and you can too! Please be sure to email me kerry (at) kerrywillardbray (dot) com with any questions you may have! Time for me to get back to drooling over the new catty and placing my own sneak peek order! Quick Gifts with Label Love! Hello friends! I'm back after a little break and happy to be sharing a gift idea with you today! Ready to see some more of these mason jars? These are some 6 oz. Ball canning jars that I filled with a few tea bags and some paper curls. And were embellished using the Label Love stamp set, Deco Label punch, Gold Sequin Trim, and the Pom Pom Trim. That is Brooklyn's hand in this photo -- she helped me put the jars together and to stage the photos. Brooklyn really wanted to include our "garden girl" in the pictures. Thank you again, Miss Sue for this -- we love it. Unfortunately, there is way too much glare on the jars in this shot. These jars were so quick and easy to make! And when I say quick, I mean 30 minutes from start to finish for the 4 jars I made...yes, 30 minutes! Could you travel to a gift store and purchase 4 gifts in that time? I know it would be a challenge for me to do so! Some of my fellow Stampin' Pretty Pals were the recipients of the jars -- Michelle Quinno and Martie Pollard -- and another went to Martie's friend Holly. I got to see them over the weekend and although I only got to see them for a very short time, it was so nice to do so! Paper curls can be made in minutes -- cut narrow strips of Designer Series Paper (1/4" to 1/2" wide by 6" long) and use a bone folder to curl. If not as curly as you'd like, quickly twist around your pinkie finger. When embellishing the jar, double up some Baker's Twine and tie it around the base of the lid (there is a little lip of glass that will hold it in place). Next, grab your sequin and Pom Pom trim and use the excess Baker's Twine to knot on the trim so it will fall loosely. Again, these are so quick and easy...give them a try! P.S. About that little break...Last week was school vacation week in New Hampshire and we took the girls on a trip. We went to the Great Wolf Lodge in the Poconos and we stopped in New York City on the way. It was lots of fun! I did pack a couple Paper Pumpkin kits to work on while we were away but we never sat long enough in our hotel to work on them at all!